Time flies. I’ve been around this hobby for over 26 years. I still remember the first time I read a little digest magazine filled with brand names that I did not recognize around 1991. That was a very different time. Internet was getting invented at the university I was attending. Everyone at school had an email account. But nobody was surfing the web, or walking around with a little computer on the palm of their hand. The audiophile industry seem to have a clear doctrine, to pursue the goal to reproduce the sound as accurately as we can. The golden standard, of course, was an actual concert or live event. We audiophile, as preached by all the audio magazines then, should attend more real life concerts and use them as measuring sticks to judge how worthy each piece of equipment is. Then came the debate on whether the system’s true purpose was to bring the concert into your living room, or transport you to the actual event in a place larger than your room. I can definitely see both sides of the view depending on the type of music that I was listening to at the moment. I grew up listening to classical music, and I would definitely agree that when I listen to a classical symphony, I would want to be transported to that particular concert hall, not cramming that orchestra into my small-ish listening room. Although I listen to a broad range of music from various genre and from all over the world, Jazz, which I discovered in college, has remained my favorite. The problem is most of the musicians I like, from the 1950s and 1960, are mostly dead or too old to play. I was lucky enough that in the 2000s, San Francisco hosted many Jazz Festivals, and I was able to catch several of my “heroes” in person, such as Sonny Rollins and McCoy Tyner. As I stated earlier, I tend to subscribe to the viewpoint that the equipment should transport me back to 1964. Unfortunately, I would never get to know what a live concert should sound like with John Coltrane, Miles Davis, or Bill Evans. So using that as an absolute reference point to judge whether a system sounds right or not would never be possible, unless someone invited a time machine and takes me back to every one of those concerts I want to attend. So the best reference I have would be my own very biased imagination of what a real concert should sound like. Fast forward to 2017, now I have a fairly demanding full-time job here in the Silicon Valley, two school-age kids, constant distractions of texts, e-mails, and other social media twenty-four seven. So who has the time to attend live concerts? I am sure many of you still do. But for me, committing a huge chunk of time to an event such as movies, concerts, golf, and dinner-without-kids, have become not just a huge commitment, but a huge undertaking in logistics – shamelessly begging siblings, cousins, and any close relatives, to babysit the kids, getting the kids fed early, ensuring we pick up the kids on time, and so forth. Sometimes, listening through one-side of an LP without getting disrupted or called away is a challenge. Dagogo readers with kids can emphasize. When I walk into my listening room these days, I want the music to take me away from constant bombardments of the day-to-day noises. Transport me to somewhere other than here. I want the music to get my brain to stop thinking about work and focus on the music and emotions/old memories those music evokes. People have different priorities when listening to a piece of equipment. Some are drawn by that magical, sweet midrange; some crave for the extended dynamic range; some people care about the chess-pounding bass. I tend to be detail oriented when I listen to music, I tend to listen for the nuances, minute details, the movement of air around strings. I find those things draws me closer to the performers, especially in small classical and jazz ensembles and vocal performances. 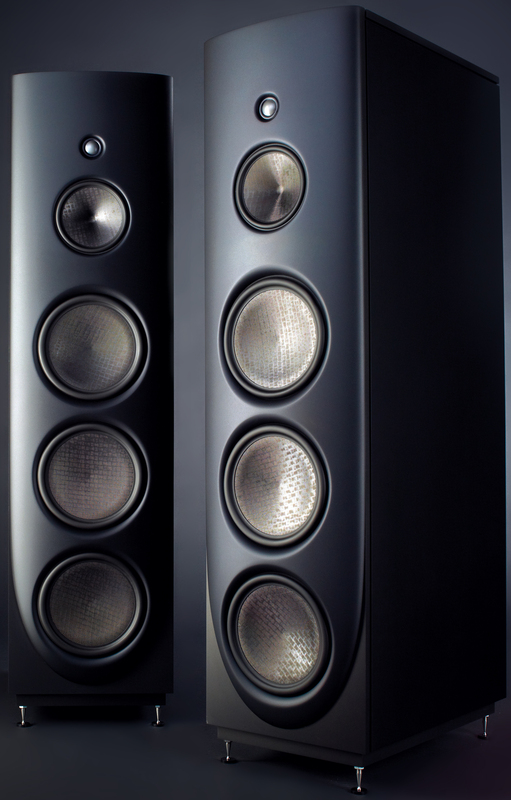 Type: Four-way, five-driver, sealed-enclosure, floorstanding loudspeaker. Drive-units: 1" (25mm) beryllium-dome tweeter, 6" (152mm) Nano-Tec–cone midrange unit, 9" (228mm) Nano-Tec-cone midbass unit, two 9" Nano-Tec–cone woofers. Frequency response (in-room): 18Hz–50kHz, ±2dB. Dimensions: 47" (119.38cm) H by 19.5” (49.53cm) D by 11.8" (29.97cm) W.
Weight: 420 lbs (190.5kg) each. Price: Q5 M-CAST, $65,000; Q5 Anodized, $71,500. Magico, Inc., 932 Parker Street #2, Berkeley, CA 94710. Tel: (510) 653-8802. Fax: (510) 649-9700. Web: www.magico.net. Thanks for the interesting and informative review. The transportation of the speakers was quite the ordeal. I hope you one day get the speakers off the casters. I will seek out Magico at my next audio show visit. Frank, Nice review, but much editing needed…. there are 3 woofers for one thing ! Anyway, there is so much redundancy as we have all read about the Magico way ! But, your personal experience of listening was very compelling…. just too brief. I would have been far more interested in hearing about your listening experience as aposed to the logistics and manufacturing ! Q5 has a mid-bass woofer and 2 bass woofers. The mid-bass and bass are crossed at different points, so it’s not quite correct to call it 3 woofers. I agree with the sentiments about the logistics. I don’t care for reading about how they got into the audition room, I only care for reading about the listening impressions encountered during the audition itself. I am somewhat curious why Q5 has been reviewed in the first place. It’s been around for 7 years (which in Magico time is an eternity) and will soon be a legacy product. M6 is new (May 2017) and a far more relevant speaker to review. He reviewed them because they are his speakers and this was his experience of obtaining them and enjoying them. If you want a review of the latest speaker then buy a magazine. I was happy to hear the issues and opinions of somebody buying with their own “hard earned” not being loaned the speakers for their endorsement.